A crappier fireball. Better than no fireball though. This card has halfed my winrate against warriors. Thanks to Pirate Decks, looks like this guy might need a nerf. I really like the fact that my opponents face explodes whenever the strike touches it. If that's too OP you could make it 2>2>1 or 2>1>1 I just think the mechanic would be fun and it would give us more than just single target DMG. i find mortal strike fine and don't understand why people would dislike it. do they only know of control warrior? aggro decks would just love this but my real concern is 12 is kinda low. i feel 14 would be a bit more suitable for the 6 damage. Ptahata! I like guy who says he like golden animation. If this dealt 7 damage when under 12 health I wouldn't feel so bitter about Fireball. 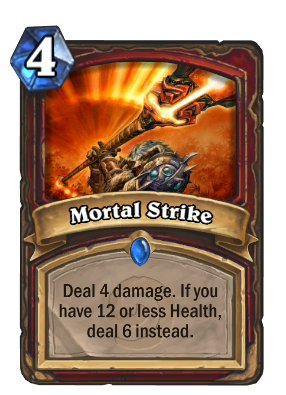 Why does fireball cost 4 mana and do 6 damage and this only does 4 damage unless you're under 12HP? Because this is for warriors, and fireball is for mages. That doesn't answer my question but thank you for trying. Well Warrior is a much more aggressive class then mage, so giving them a 4 mana fireball would effectively make that class OP. Comparing cards dealing damage with same cost, a mage's is the best in most cases. According to that logic , mages should get Innervate. And trust me , nobody wants that. Those comments are irrelevant, because no one says all classes should have the same spells or cards, but giving one class a card which is bad version of another card is just stupid. the only 2 other exapmles of this are non-class cards (the 5/4 taunts and Dr.boom vs war golem). Maybe 4 mana 6 dmg is too OP for warrior, but it's not a good reason to give it a card which is objectively worse. They could make dmg spell that works in other way, maybe do something else above 12 health, but this is just ridiculous.